Tired of same old soup on your cabbage soup diet? 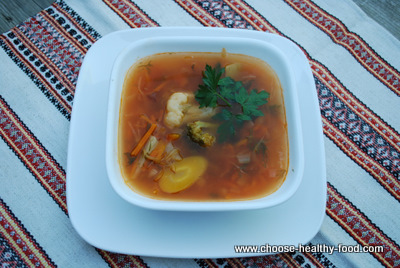 Try this Russian meatless cabbage soup called "schi", it is very easy to make. Out of 30 minutes of total cooking time, only 10-15 minutes require your active involvement. Using Borner mandoline slicer reduces slicing time by five minutes, and creates that uniform look of vegetables in soup. Cabbage soup was not invented by the diet gurus, neither it needed to be "veganized". It is a staple of the diet in many countries. It is very low in calories, yet very filling due to big amount of vitamins, minerals, complex carbs and protein. And it is tasty! Every time my daughter takes it for lunch, her teen friends ask her to share. Isn't this the greatest testimonial? If you like your potatoes soft, add salt and sour components at the very end. Boiling potatoes in the salty/sour water makes them hard. Losing weight with the cabbage soup diet is easy - this diet is good for you, creates dramatic results, and allows for variety of cabbage soups. Using Borner mandoline sliser makes shredding veggies so fun that you almost feel sorry that it takes so short to cut them! Reduce the heat and increase boiling time of the soup if you don't like your veggies crisp or don't want to chew. Plant herbs in your square foot garden, and you will never need boullion cubes! Cooking time: 30 minutes. Amount of frozen veggies to taste. Please do NOT exclude vegetable oil even if you are on a weight loss diet. Small amount of it is necessary to have oil-soluble vitamins from the soup to be absorbed by your body. Peel and cut potatoes, red pepper, onion and carrots. Once water starts to boil, add the potatoes. Heat the pan with oil on it, add chopped garlic, onion and carrots. Fry them for several minutes, mixing often. Add crushed tomatoes or pasta sauce, red pepper, one cup of water, reduce the heat and simmer for 5 minutes. Bring to boil, reduce the heat and simmer for 10-30 minutes, depending how crispy you like your veggies in the soup. Russians usually add a dash of sour cream when serving this soup. You can add mayo or just eat it as is.